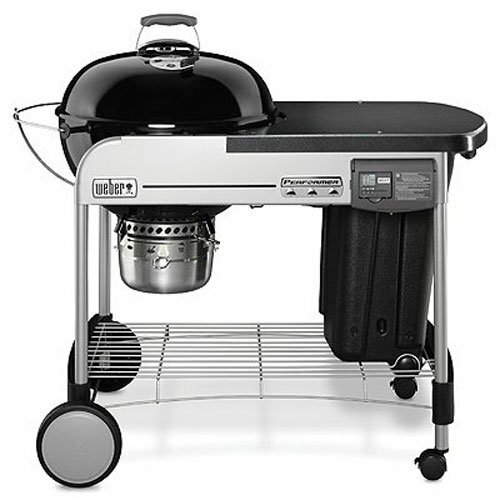 Chances are, you’ll have heard of the Weber 15501001 Performer Deluxe Charcoal Grill. Since its release, its become rather iconic among outdoor cooking enthusiasts, and in fact it’s probably the most well-known grill ever produced. As far as I’m concerned, it is one of the best charcoal grills out there. In this Weber 15501001 Review, I’m going to explain the reason for these high accolades, and I’m also going to explain about power, versatility and most importantly, about the quality that leads to a grill becoming famous. The measurements are a large 41.25 inches in length by 50.25 inches of width and it has a height of 28.5 inches, so buyers are getting a rather large grill. The weight is 99 pounds fully set-up which is a good weight, and is indicative of Weber’s decision to use only high-grade stainless steel. I’d make sure two people are present if the grill requires lifting to a different part of the property for cooking on, but it shouldn’t be a problem to lift. It looks great too, with a huge bowl and lid alongside a foldout table for food preparation, and sturdy legs. The assembly time is one hour, which is considerably more than other grills, and I’ve started with this because it’s really the only critique I have what is an outstanding grill. Now that’s out of the way, let’s focus on the exquisite performance. We are talking a large cooking area of 365 square inches, including a huge 22 inch porcelain bowl, complete with lid. I cooked a three course meal with ease, and buyers are going to be able to cook even larger amounts of food in this without any trouble. The bowl is so good for searing meat, that weber, ever the perfectionists, have used it again on other models. 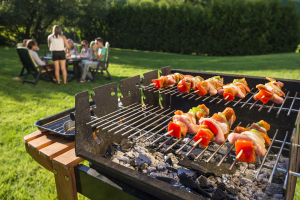 Food on a grill can often taste slightly like charcoal, and this is because of drippings from the meat and other items, hitting the flames and producing smoke, which get inside the food. With the 15501001 all drips are caught, for a terrific, flavoursome meal. Weber tend to go the extra mile, so while other manufacturers thought coating the cooking surface with porcelain, made cleaning easier, Weber have included this, but took the extra step of adding a high performance ash catcher, for even better results. The Weber 15501001 also has fantastic grates that cook evenly, a quick one-touch ignition, so in terms of results, buyers aren’t going to find a grill on the market that cooks better food than this. There’s a handy metal table too. In short it’s the complete grill, which is why its become iconic. It’s the best, and Weber have thought of everything here from easy assembly, the top grates, to a great little timer you can take indoors. So, while it might cost between $300 and $450, your getting an iconic piece of equipment in the Weber 15501001 Performer Deluxe Charcoal Grill, and it’s something that will last a very long time. Weber is made it out of high grade stainless steel, for rust free cooking and storage, and the large cooking surface will enable buyers to invite as many friends over as they want without running out of space. A must-buy. Best Portable Charcoal Grill – You’re Gonna Want These!